Martinis are a cocktail classic. Traditionally made with gin and vermouth and garnished with an olive or lemon twist, this combination makes for a cold and crisp concoction. A classic martini calls for five parts gin and one part dry vermouth. Over the years martinis have become a versatile cocktail with many flavor profiles. Sweet, tart or savory—the options are endless. We’re here to help you discover a new favorite. A gin martini has a very botanical flavor. Gin is made with juniper berries, which aren’t berries at all, they are seed cones. Some say the pairing of gin and vermouth gives it a pinecone taste. Over the years vodka has become a popular alternative to gin in martinis. A vodka martini offers a smoother taste and has been a contributor to the evolution of the martini. 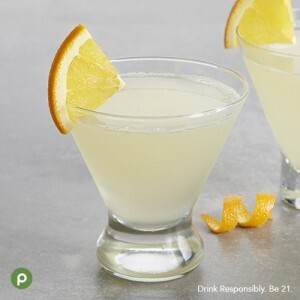 Due to its neutral flavor martinis go well with a lot of different flavor mixtures. Whether vodka or gin is your preference, vermouth is the common ingredient in many martini recipes. Vermouth comes in sweet and dry. It is a fortified and aromatized wine made with a mix of botanicals. To break that down, it’s essentially wine made with brandy and then infused with herbs and spices. 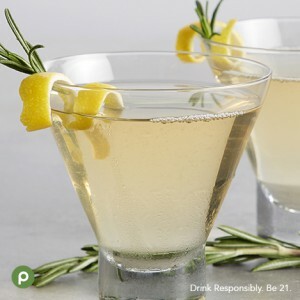 Dry vermouth includes an ingredient called wormwood, the shrub known to create absinthe. Ordering a traditional martini? These are some of the most popular. Contrary to James Bond’s preference of shaken not stirred, a bartender’s rule of thumb is if a cocktail contains only spirits, it should be stirred. If you shake the ingredients before serving it can dilute the cocktail, changing the taste and consistency of the cocktail. This is all personal preference, of course. Some even enjoy the ice shards in their martini. You will find many sweeter vodka martinis are made with a shaker because they contain mixer ingredients such as fruit juices. Remember that different brands of liquor offer different flavor profiles, so do your research before purchasing a bottle. Not sure what would be best? Visit one of our Publix Liquor Stores. Any staff member can help you choose the perfect ingredients for your cocktail. 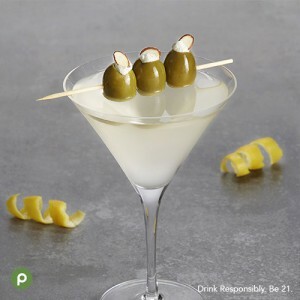 This cocktail offers a salty and olive-y flavor. Make some Blue Cheese Stuffed Olives to place in your cocktail or enjoy on the side. Another great treat that accompanies this cocktail are Neptune Cups. These are made with imitation crab, shrimp and cream cheese, leaving you with a savory taste. 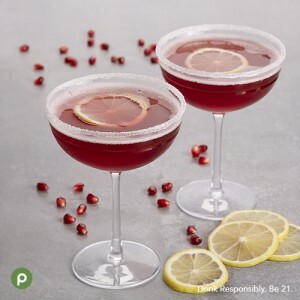 With a sugar rim and cranberry-pomegranate juice, this is a sweet martini. Pair with hollowed cherry tomatoes filled with Boursin cheese. Top the tomatoes with sprigs of fresh dill or parsley for some extra flavor. Refreshing is the adjective we use to describe this cocktail. You can substitute peach or raspberry flavored tea to give it a different flavor profile. Pair with Baked Chipotle Fish with Citrus Mint Rice or fresh cut fruit. This martini is made with whiskey and confectioner’s sugar. 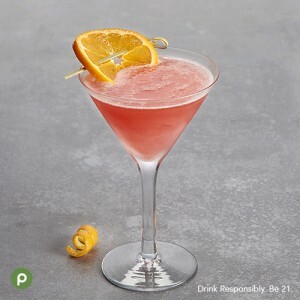 For a citrusy twist, substitute lemon juice for the lime juice and orange liqueur for the grenadine. Serve this cocktail with any of these Coast-to-Coast sliders or bakery brownies. This one is for you gin lovers! This recipe calls for orange marmalade, which pairs beautifully with the gin. You can make this a Sicilian Martini by adding 1/2 ounce of bitters and 1/2 ounce of simple syrup. Bake a Southern Squash and Shrimp Quiche for a savory union. There are hundreds of unique martini recipes. Do you have a personal favorite? Share your recipes with us in the comments below. Follow us on Pinterest and Instagram for more recipes and meal inspiration.